For years, the financial services industry has been in a state of disruption, facing more competition, commoditization, and regulation than ever. As the industry turns the corner and looks to profitable growth opportunities, it faces many challenges, including how to increase business speed through automation, improve customer experiences, boost efficiency, and reduce cost. Simultaneously, financial services institutions must meet the highest standards for security and compliance. 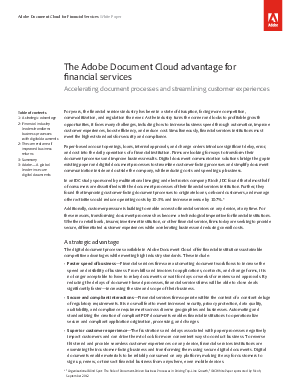 This white paper illustrates the advantages of using Adobe Document Cloud for financial institutions. Download now to learn more about how the financial services industry can benefit from a digital document solution.